The newest popular British boy band One Direction was sued by One Direction of a California pop-rock band by using the same name. A multimillion dollar lawsuit that aim to stop from using the name One Direction in promotional materials. The five Britons namely, Louis Tomlinson, Niall Horan, Liam Payne, Zayn Malik and Harry Styles are now making name in the Music industry. 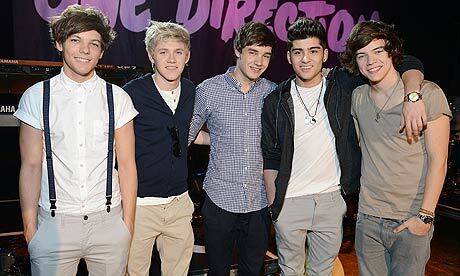 One Direction (British boy band) has alrady 4.2 million Facebook fans and 2.8 million followers on Twitter. According to the lawsuit statement, "The northern California band has been using the name One Direction since late 2009 and has recorded two albums." Last 2010, Cowell's British talent show, "The X Factor", discovered the British boy band and placed third on the talent show and went up to the top in the UK charts with their first single. Lawsuit states that if both bands still using the same name, it will caused a "substantial confusion and substantial damage" to the goodwill earned by the California group. The five-man California pop-rock band used to performed at school, local fairs and bars, according to their website. Comments or suggestions about "One Direction sued by California band with same Band Name" is important to us, you may share it by using the comment box below.